Part of the recently upheld Affordable Care Act that many in the disability community applaud is the elimination of policy exclusions for pre-existing conditions. I agree that our culture should not discriminate against and withhold heath care from an individual based on a physical or mental disability. 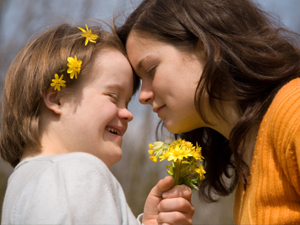 Early Intervention services, exceptional educators, and medical advances have allowed persons with disabilities to be fully included in all aspects of life, and they are making incredible, positive impacts. There is presently however an exclusion of life for many people diagnosed with prenatal pre-existing conditions, and these individuals will never have the opportunity to access the benefits of health care coverage. They desperately need a “Life Assurance Policy” which grants them the right to be born into a lost world that has lost focus on our Creator and is obsessed with misguided perfection and self. My beautiful 9 year old daughter Chloe and many other priceless children have the pre-existing prenatal condition of Down syndrome, and currently 90%+ of these humans are denied health care coverage by being eliminated once they have been labeled defective and unwanted. Chloe is a very healthy, happy, vibrant, loved young lady who just finished 3rd grade and reads at a 4th grade level. The rapid advance in prenatal screening is allowing our world to identify more and more perceived “disorders,” and “with a blood sample from the mother and a swab of saliva from the father scientists could soon be able to screen unborn babies for more than 3,000 genetic disorders” (http://www.kgw.com/lifestyle/Unborn-genetic-tests-being-perfected-at-UW-159091375.html). What value is Health Care Coverage for pre-existing conditions when the individuals who would benefit from this mandate are eliminated before they can enter this world? Many in our culture of death are fighting to ensure that the very instrument (abortion) being used to terminate pre-existing, prenatal conditions is covered by Health Care, and when did the termination of human life become an issue of health? Would a person who believes in a clean environment sanction the dumping of toxic waste in rivers and streams? How can a person claim to be a supporter of persons with disabilities when they ignore a silent eugenic movement that could lead to the extinction of these irreplaceable human beings?